Pepsi Center is filled with No. 19 jerseys. Everywhere you look, someone is donning a Joe Sakic sweater, or a Milan Hejduk sweater, honoring the longtime Colorado Avalanche players. A jersey not as easy to spot is No. 5. Unless you're looking on the ice. Brett Clark is not a flashy player. His greatest moments are rarely highlight reels, but if you ask anyone in the Avalanche locker room, the defenseman might be the most valuable player on the team. "He's a heck of a player," fellow defenseman Ken Klee says. "Before I got here I didn't know much about him other than what I heard from (Steve Konowalchuk). Kono said, â€˜Listen, this kid's the real thing. He skates well enough to be a top two defenseman on any NHL team.' I have to admit, he is." Clark might be one of the best pickups that nobody noticed. Brett had played 146 NHL games for Montreal and Atlanta before falling off the radar following the 2000-01 season. He appeared in two games for the Thrashers in 2001-02 before the Avalanche acquired him for Frederick Cassivi on Jan. 24, 2002. He went to Hershey, the Avalanche's American Hockey League affiliate at the time, where he played 243 games for the Bears over the next three seasons. Then, at age 28, with the lockout over, Clark got another chance at an NHL career. "When you're down there riding the bus night in and night out over four or five years, you're wondering if you can ever get back there," Clark says. "I always had the dream and never gave up that dream. Fortunately, the lockout happened, some guys retired and I had a chance here." It has turned out to be a win-win for player and organization. 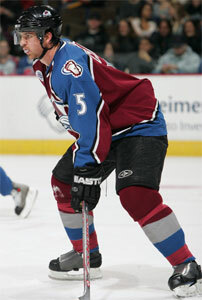 Clark became a mainstay on the Avalanche blueline in 2005-06 and he established career highs in games played (80) goals (nine), assists (27) and points (36). This year, he has become the rock on a strong defensive corps. "It's an interesting story about him," defenseman Patrice Brisebois says. "He's a really good defenseman. It's amazing because he got his chance, and he showed he can play at a high level." Halfway through the season, Clark led the Avalanche in ice time at nearly 24 minutes a game, and the significance of that isn't lost on him. "It means they have the confidence in me and they want me out there in that situation," he says. "It's a great confidence booster. It's a great challenge. You have to prepare different every game." Clark trails only John-Michael Liles in points by a Colorado defenseman while providing steady leadership from the blueline. "He's very steady, very reliable. Offensively, off the rush, off the point on the power play, he makes good decisions with the puck," Avs coach Joel Quenneville says. "That compliments the new style of game. His reads defensively are good. You can see a guy that's played with a lot of confidence over the last year. He's progressed to being a different type of defenseman for us." It's a big difference for a player who 18 months ago was wondering if he would stick on an NHL roster. "I didn't think I'd be logging the ice time I am. It's a big boost for me. My attitude last year was I had to do everything in my power to make them notice me," Clark says. "Starting off the year I played a few games up front (at forward), I played some penalty kill up front, and then I worked my way back to the blueline. I can't complain. I took the opportunity that came to me. I got more ice time as the year went on." He took advantage of that ice time and became an invaluable part of the team. "People don't realize how smooth of a skater he is, how slick he is," Klee says. "You see him get us out of trouble. He goes back for the puck and gives a little spin-o-rama or he looks up and sees a hole and jumps in where most guys wouldn't be willing to take the risk to make a play like that. He skates so well, he sees the ice so well and he makes great decisions with the puck." Clark didn't always dream of being a grinder. Like many kids growing up, he liked to score goals. "I was nothing about defense," Clark says of growing up in Regina, Saskatchewan. "You just want to go out, score goals and have fun." Playing in a small town, ice time wasn't hard to find, but having enough players was sometimes a task, and Clark got a chance to play every position. "I played everywhere," says Clark, who idolized Ray Bourque and Paul Coffey as he grew up. "One year, we only had seven players, so you were on the ice all the time. We spent many hours out there." As he got older, he found his calling on defense and took his skills to the University of Maine, where he played one year for the Black Bears. The Canadiens drafted him in 1996, and on Oct. 4, 1997, he made his NHL debut. He scored his first NHL goal on Dec. 23, 1997, which happened to be his 21st birthday. Over the course of two seasons, he played 102 games with Montreal before Atlanta took him in the 1999 expansion draft. There, his career seemed to stall. He played in just 44 games for the Thrashers before ending up in the minors. "I just tweaked little things here and there," Clark says of his work in the AHL. "Nothing really big. I just went down and worked hard. I think I had to turn myself into a better defensive player." His time in the AHL also taught him not to get too comfortable in the NHL. "You don't want to take anything for granted; that's my mentality," Clark says. "I've had a long career, a lot of years in the minors as well. You never know what's going to happen one day to the next. I take every day as I have something to prove. That's the biggest part of my game - that I always have something to prove. Prove that I should have been here and I can be here, and that's going to help me down the stretch." There are some aspects of minor league hockey that stick with players, but the perks of playing in the NHL - despite going against top-notch talent every night - make life easier. "It's a whole different game up here. Everyone's so much better, the game's faster, the travel's better," Clark says. "There's no three in three nights; there's only back-to-back games. Down there, you get a close-knit group of guys because you're on the bus so long and with them every day. I have no regrets, and it helped my game progress and helped me get up to the NHL." Not bad for an under-the-radar player who, when he finally got his chance, made the most of it.